Wind-swept rain pounds the windows outside the computer lab in Acopian Engineering Center. 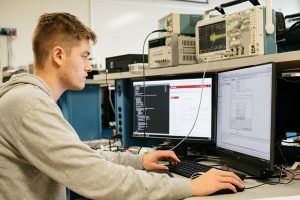 Since 8 a.m., Geoff Watson ’18 (electrical and computer engineering) has been fixed on two monitors while tinkering with a digital data receiver. He checks an oscilloscope, which looks like a medical device in an ICU, on a shelf above him to determine the magnitude of the signal. It’s tedious business, this senior project. You can just tell. Around him sit empty, stained coffee cups and curled paper plates sprinkled with pizza crust crumbs, evidence that students have occupied the lab for hours. Earbuds back in, he resumes his work as another downpour rattles the windows.